From its early days cinema has showcased violence. Whether it was boxing matches or recreations of historical events violence has been infused into the very nature of the medium. If we believe the old story about the Lumière Brothers scaring their Paris audience the beginning of Cinema was a violent act in itself. With this presentation of violence came politics. Perhaps it was the accessibility of cinema that made it open to more political interference than literature or theatre (although these were also messed with), the fear that the plebs, who wouldn’t/couldn’t read or understand high culture, would be corrupted by this new form. Early on movies were being banned for their violence, but sometimes the reasons were as much politically motivated as out of a ‘duty’ to protect the masses; in the US one early boxing film was banned on racial grounds, as it showed a black boxer beating a white boxer, undermining the ‘inherent’ superiority of the white race. The dominant discourse on violence today remains rooted in the spurious effects debate. Every so often a film is seen to be the cause of society’s ills, or it offers the potential to corrupt and degrade. A cursory glance at the history of Hollywood film offers a list of titles that have been suggested as, but never proven to be, the inspiration for real acts of violence. Films such as Rebel Without a Cause, Taxi Driver, Natural Born Killers, Scream, Child’s Play 3, not to mention the litany of 1980s Video Nasties have been implicated. But this debate fundamentally lacks an understanding of the complicated ways in which the audience experiences film violence. In this article I’ll outline some of those ways, in the hope that we can move the debate a little further from the purview of the Daily Mail. The paratext are the texts that surround and inform any individual text. Generally speaking we don’t watch movies in a vacuum, particularly now as we’re constantly bombarded with trailers, posters, websites and even trailers for trailers. These elements, also known as the Narrative Image, inform and mediate our responses to cinema, including how we understand the violence. In short our experience and understanding of film violence occurs before (paratext), during (spectating) and after the film (in the ways we remake the film in our memories, how they compare to other texts, etc). Beyond these paratextual elements are the social and political contexts that inform the text and our responses. 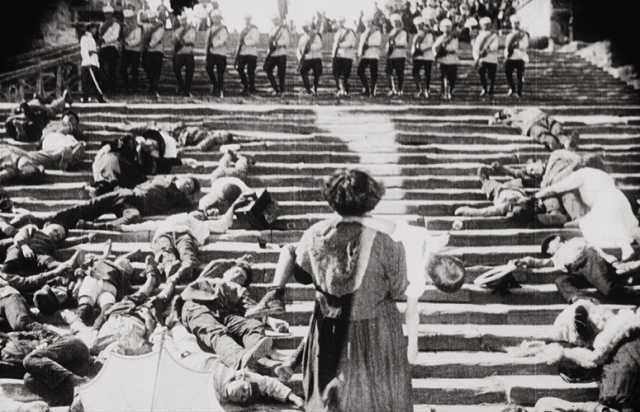 To give a brief example most film students are forced to watch the Odessa Steps sequence from Battleship Potemkin (Sergei Eisenstein, 1925). But the context of watching this in the 21st Century, in Europe, can’t match the context of post-revolutionary Russia, or interwar Britain where the film was banned. Our approach to the film is framed by these paratextual elements of expectation where a genre, title or star, can confirm or subvert. Generic and narrative expectations are another major part of this experience, elements which are, by and large, set by the narrative image. The Western is a genre that depends on violence – the narrative is organised around the final shoot-out, the showdown between protagonist and antagonist. It would be ridiculous to watch a mainstream Western then and be surprised by the violence in the final scenes. The emotional response to such a moment is therefore conditioned by expectation. Films that muddy the generic/narrative waters generate different responses. Take the violence in Pan’s Labyrinth (Guillermo Del Toro, 2006). The film is framed as a fairytale of sorts, in which a small girl (evoking characters like Alice), explores a world of fantastic creatures. Then a man has his face bashed in with a bottle. Nothing in the narrative/genre has suggested this event, the impact is greater. These elements of genre/narrative and paratext also condition the modality of the films. Modality is the level of reality that we ascribe to a message. For instance the News has a higher modality than Tom and Jerry; one presents itself as a true representation of reality, the other is a cartoon in which impossible events occur. Films generally exist somewhere between these two extremes. A film that employs documentary style camera work conveys a higher modality than one that involves impossible CGI shots. Similarly the advertising of a film can stress fantastic or realistic elements. Early coverage for The Blair Witch Project presented the film as true, that the footage had been recovered. For those early audiences the film had a high modality, creating a different response to later viewers who watched is as part of the normal horror genre. If our approach to film violence is conditioned before we even sit in the cinema what then of the films themselves? One cannot hope to fully elucidate the complexities of this in a short essay, but I can outline a few significant elements. Prince (1998) breaks film violence down into three elements; the referential act, the stylistic encoding and the stylistic amplitude. The referential act is the act of violence that the film depicts. Our understanding of this is complicated in itself. Has the audience experienced this act themselves, or seen it before in other films and media? Each act of violence in a film is seen in comparison to other films and the real world. Increasingly the violence we see bears no resemblance to our life experience – our referent becomes other films. The stylistic encoding is how the referential act is depicted in the film, the shots used, the sound, etc. Take for comparison the finales of High Noon (Fred Zinneman, 1952) and Dirty Harry (Don Siegel, 1971). In High Noon the hero, Will Kane, shoots the villain Frank Miller with a single bullet. It takes 5 seconds of screen time and is shown in a single shot from where Kane stands, leaving Miller in the background. When Harry shoots Scorpio over 8 single shots are shown, taking just over a minute of screen time. When Scorpio is hot we see, from multiple angles, him thrown backwards, blood spurting from his body; the same referential act, encoding in two very different styles. The final aspect, the Stylistic Amplitude, covers ideas of graphicness and duration of the encoded act. In essence the more graphic the depiction the greater the duration. The more of the violence we see the more significant it is in the film’s running time. As a general trend in Hollywood cinema more time is given over to violence in movies. As a final issue we need to consider how the film positions its audience in relation to the characters that enact violence. There are two positions available, one subjective (we watch/follow/align with a character(s)), the other objective (we are not aligned with anyone, we watch separate from the action). This makes a big difference in how we relate to a film. The subjective camera, using shots like point of view, implied point of view and over shoulder, invite us to partake in the violence. Narrative techniques, such as narration, further encourage our identification with characters and violence (a good example of this is Taxi Driver (Martin Scorsese, 1976)). The objective camera keeps us at a distance, although we still align with a protagonist through convention, leaving our involvement as less participatory. Moving the discussion about film violence away from the tabloid headlines and towards a technical understanding of cinema and its audience is essential if we’re ever to puzzle out how and why people watch violent films. If we can do that we may be able to finally kill off the histrionic exaggerations, with or without the use of a shotgun.